The benefits of an assertive attitude include improved teamwork and leadership (because people work together), and better interpersonal skills as you learn to listen and take account of other points of view. In turn, this can lead to improved confidence and reduced anxiety, and better problem solving skills. When we think these things are threatened, we are likely to respond with aggression or fear. Work out which of the areas above are most important to you by looking out for situations where you feel defensive or threatened; this is where you need to practice responding calmly and assertively instead of having a 'knee jerk' reaction. Observe how colleagues and family members respond to each concern as well, especially if you get into conflict with that person a lot. 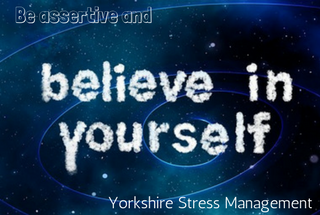 Assertiveness skills will help you defuse those situations in future. In short, understanding the needs and desires of yourself and those around you is the first step to getting those needs and desires fulfilled. The Centre for Creative Leadership has found that women are twice as likely as men to be described as “bossy” by colleagues  , and women receive critical feedback about aggressive behaviour in 75.5% of their performance reviews versus 2.5% of men’s  . Persons of colour, especially black people, can also suffer from being perceived and stereotyped as aggressive, especially when they respond negatively to offensive comments or actions, or do not conform to white social standards (for example, a black woman who straightens her hair will be perceived more favourably)  . In these circumstances, assertiveness can be really helpful, especially if it’s used with care. Stanford University’s study found that women received three times as many promotions when they were able to 'self-monitor' and vary their behaviour depending on circumstances, learning when it is 'safe' to express traditionally masculine levels of assertiveness  . 2. Letting the other person speak before expressing your views may help to put them in a good frame of mind for listening to you, and finding as many points as possible to agree on will also help. The goals are to express your view and find common ground wherever possible, without either being overbearing or allowing yourself to be ignored. 3. Don’t confuse assertiveness with passive-aggression either. Avoid behaviours like sarcasm, avoidance, rudeness through body language, and agreeing with someone now but disagreeing later (especially behind their back). This will result in people not trusting you or wanting to ask for your input in anything, and will make it less likely that you will get what you want. 5. To increase the chances of success, set a positive mood; make sure nobody involved is hungry or sleepy or otherwise likely to be irritable, make sure your discussion is at a convenient time and no one is too busy with other stuff, and ensure everyone has had time to prepare. It is easier to remain calm when you are managing your stress well; see elsewhere on this site for tips about that. 7. When explaining something, provide sufficient detail for them to understand the issue, but not too much. Be straightforward and do not go off on tangents or bring in past arguments on other issues. 8. Don’t sugar-coat the situation or apologise for your own thoughts to spare someone's feelings. This (of course) doesn't mean you should deliberately hurt or upset them, or turn the discussion into a personal attack. Using 'I' statements is a good way to do this, for example 'When you say that, I feel undervalued' instead of 'you never show me any respect'. 9. Stay aware of your body language; keep eye contact without glaring, keep your tone firm and even, and do not raise your voice. Assertive posture is smooth movements, relaxed but upright body, firm stance, and appropriate and not exaggerated gestures. Hold an open posture; arms at your sides or held out rather than folded, palms out rather than in fists. Remember to smile! 10. Keep up the assertive attitude even if the other person doesn’t! If they get angry or passive-aggressive, don’t let them draw you into a fight. Do not insult, yell at, or threaten the other person, avoid foul language, and keep your temper. 11. Criticise actions, not the person; for example, 'I was very hurt when you called me that', not 'You are horribly rude'. Don’t try to push the other person into doing things your way; remember that their reasons are valid to them. 12. If you can't get everything you want out of the discussion (and you probably won't) look for ways to negotiate a compromise. If they really won’t or can’t move on the issue, walk away rather than getting angry. Consider enlisting the help of a third party who can mediate between you. 13. If you need a response to aggression, try a technique called fogging. Acknowledge the attacking statement without promising to change the attacked behaviour unless you actually intend to change it. For example, 'I can see you don’t like it when I do that'. 14. A possible response to complete dismissal, on the other hand, is the 'stuck record' technique; simply repeat your needs calmly and politely until the person gets the message. 16. Remember to express appreciation for the other party! Acknowledge and thank them for even small positive responses, and accept that their needs and desires are important too. Try practicing these tips before you need them next; ask a friend to join you for a fake debate to hone your skills. Be patient and keep practicing, and soon you’ll get the results you want! And if you need help in developing these skills, please get in touch. Author: Debbie Waller is a professional stress management coach, specialising in working with individuals and smaller employers to minimise stress and maximise feeling in control.Debbie is the author of Their Worlds, Your Words and has co-written the Hypnotherapy Handbook both of which are available from Amazon.